APW offers a new form of permaculture education through a wide range of workshops that focus on various aspects of ecological literacy, place making, and sustainable design and living. The workshops are intended to inspire, challenge and empower participants to action. Participants will learn design skills that integrate the environment, people and technology to create abundant and resilient ways of living for themselves and their communities. While the workshops are grounded in the Auckland bioregion, the skills learnt are easily transferred to other bioregions. The Permaculture Design Certificate (PDC) is an internationally recognised qualification and APW offer a Permaculture in New Zealand (PiNZ) affiliated PDC. Certificates are achieved when participants complete a minimum of nine of the twelve workshops and a design project of their choosing. The Design Project is an opportunity for participants to apply what they have learned to a personal and meaningful project. APW’s Permaculture Design Certificate programme includes twelve full day workshops, a PDC programme folder, permaculture design project mentoring and two design project presentation days. Permaculture is a design approach to sustainable living modelled on natural ecosystems, integrating human settlements in healthy and productive environments which provide for all human needs. The first PDC was created and delivered by Bill Mollison in the 1980s as an on-site two-week intensive course. This format was later developed into a modular programme delivered over a longer period of time. 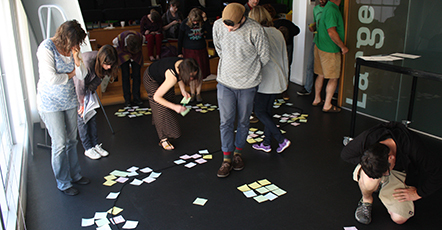 APW have adapted this modular programme to be delivered over twelve Saturday workshops and developed the content specifically for Auckland’s Bioregion. We find that the local content delivered over a longer programme grounds the learning experience and gives participants greater flexibility as well as the opportunity to integrate and apply what they have learnt to their own life throughout the year.